Indians, Settlers, and Slaves in a Frontier Exchange Economy: The Lower Mississippi Valley Before 1783 by Daniel H. Usner Jr.
Daniel Usner's Indians, Settlers, and Slaves in a Frontier Economy demonstrates that the idea of the Old South of both postwar and colonial southern history should not obscure historians views of the Deep South before Americans colonized it. We should not read antebellum racism, relationships, and categories back into the deeper past. We need to break down Louisiana - it was not just a massive, boundless territory of scattered Frenchmen. The Lower Mississippi Valley was its own world, if not self-contained at least coherent on its own terms. Benign neglect from the powers-that-be back in Europe had allowed a fluid setting to develop in which a handful of settlers and slaves could hammer out practical economic relationships with the still-substantial local Indian population. Chief among these activities were subsistence agriculture, the deerskin trade, hunting by slaves and Indians, etc. The inter-imperial conflicts of the 1760s precipitated greater European attention to the region. As imperial leaders insisted on directing the settlements' function toward commercial agriculture, the Indians became marginalized, pressed for space, diminished in political leverage and unable to keep up production of skins and other goods for the consumption of local whites, who were busy setting up increasingly restrictive plantations. By the middle of the 18th century, most Indian groups at the edge of Euro settlement had become "enclave or refugee communities," largely thanks to disease as well as war. Due to the treaties that concluded the Seven Years' War, France gave Louisiana to Spain, and Britain gained everything east of the MS river above Lake Pontchartrain, making the river the boundary between the two big Euro empires in North America. Both governments began pushing colonization after 1763. "The short-lived revolt of New Orleans merchants and planters against Spanish authority is the best-known but not the only form of economic recalcitrance employed during the transitional period. Settlers, slaves, and Indians accommodated to and resisted the newly emerging economic order by pursuing customary production and marketing practices, which now become more like strategies for survival." (107) Blacks began to use the border to flee from one political authority to another, but imperial officials would cooperate in returning runaway slaves, while traditional subsistence strategies like pilfering and petty trade were suppressed. 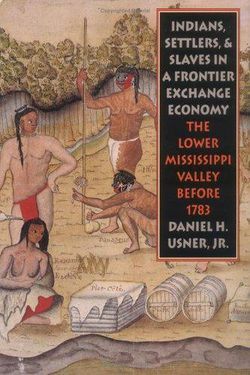 Usner insists that the old ways may have been crushed under the heel of the advancing plantation economy in the Lower MS Valley, but they persisted on a small scale long after the "frontier exchange economy" fell apart. As proof, he points to "itinerant camps of Indians selling games and herbs" in the nineteenth century, and African American street peddlers in Natchez and New Orleans. People clung to these old ways to survive since there was little place for Indians in the plantation system and the new order abhorred any black autonomy. He also argues that food, like okra and rice, is the best evidence of lasting traditions from the lost world of the 18th century.